New chief of East Nusa Tenggara province aims to call a halt to mining and weed out those operating illegally. Plans by the new governor of Christian-majority East Nusa Tenggara province in Indonesia is to impose a moratorium on mining has won backing from environmental activists. Viktor Bungtilu Laiskodat, a Protestant, said after his inauguration on Sept. 5 that he would issue a moratorium, halting all mining operations in the province, as part of a plan to rein in firms or individuals operating illegally. Instead, during his leadership the government will capitalize on the agricultural and livestock sectors as well as tourism, he said. Franciscan Father Alsis Goa Wonga, director of the Commission for Justice, Peace and Integrity of Creation, welcomed the proposed move but said Laiskodat should also follow this up by revoking mining permits. He said manganese and gold mining in East Nusa Tenggara has caused local people many problems. "It's mainly been marked by the seizure [of people's land] and environmental destruction," the priest told ucanews.com. According to Mining Advocacy Network (Jatam), some 239 permits have been issued to firms across the province. The presence of these companies has been met by protests from local communities and the church. In recent years,13 farmers have been jailed for damaging equipment in protests against mining firms, Father Wonga said. 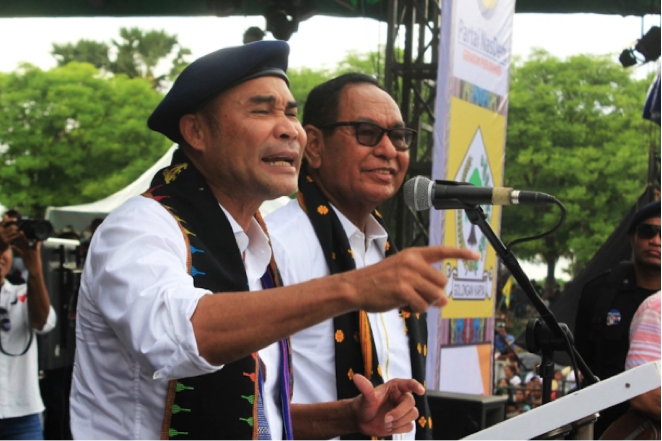 Jatam campaign manager Melky Nahar said besides destroying indigenous peoples' lands, mining firms have also encroached on 194,971 hectares of protected forest areas. "This has spurred conflicts and disharmony among local people," he said. Nahar called on the new governor to examine how licenses are awarded. "There are indications of corruption and collusion involving officials in issuing them," he said. Environmental issues became a major platform for Laiskodat in his election campaign during which he pledged to crack down on mining companies. This was in stark contrast to his predecessor, Frans Lebu Raya, who governed for 10 years and issued many mining business permits. East Nusa Tenggara province has a population of 5.2 million, of whom 55.4 percent are Catholic and about 1.1 million are considered poor.